Shuang Pei Nai 雙皮奶, translated as 'double skin milk'. This is a popular Cantonese dessert. It's a velvety smooth milk custard with double skins on top, first skin is formed during cooling the boiled milk and the other when cooling the cooked custard. It's quite an easy pudding to make. Just need a bit of patience and practice. My instructions may look complicated because I added in all the little details you may not find in other recipes. Simple ingredients just full cream milk, egg white and sugar. 1 bowl per serving. Each serving use 200 - 215 ml full cream milk, 1 large egg white and 1 - 3 tsp sugar depending on how sweet you like it. First get some Chinese rice bowls or ramekins (around 250ml). Heat the milk in a saucepan or microwave till boiling (I normally boil in the microwave using a jug). Remove any bubbles floating on top and pour the very hot milk straight into the bowls/ramekin. Leave the milk to cool undisturbed and uncovered. You will soon see a skin forming. If you do not use full cream milk the skin can be too thin and may disintegrate once you pour it out later. If you use full cream milk and you don't see a good skin forming (by the wrinkle on the top) after 10 - 12 minutes cooling, put the bowl in the microwave on high for about 1 min. Take it out to cool. See slide show below for the whole process. When the milk is cooled. Ready for the next step. Use a bowl or jug (big enough to hold all the ingredients together), beat the egg white and sugar. Avoid whisking in too much air. Use a pointed knife or cocktail stick gently touch to break the milk skin (by gently pushing it away from the side of the bowl very slightly) from the side where you are going to pour the milk out and another area directly opposite. Be careful not to pull the skin away with the knife/cocktail stick. The reason for breaking the skin before pouring the milk is to make sure the skin will stay in the bowl and not being pulled out together with the milk into the mixing bowl. Pour the milk into the bowl containing the egg white and sugar. You will now see the milk skin lining the bowl. You need to make the custard mix very quickly to avoid the milk skin getting dry and stuck to the bowl permanently. Beat all the ingredients till combined. Sieve the liquid into a measuring jug or a mixing bowl with a pouring lip. Carefully pour this liquid into the bowl from the side of the bowl. The milk skin should now float onto the top (see slide show). This is now ready for steaming. Put the bowl into a steamer, starting with cold water. When the steamer water is boiling (when you hear the water boiling and steam coming out), lower the heat to medium (if using stove top steamer) and continue steaming for another 5 - 6 minutes, check if the custard has set. If not continue steaming for few more minutes or till the custard is set and a little wobbly in the centre. (Time depends on your steamer and amount of steam). If the custard swelled on the top and looked like honeycomb inside, you have overcooked it and it will not be velvety smooth. If the custard swelled on the top and the inside is still watery, this means the steamer was too hot, you need to lower the heat. If you are making this first time and more than one/two bowls, steam one bowl first to gauge how much time you will need in total and steamed the others using fresh cold water again. Take the custard out of the steamer. Uncovered and let it cool. You should see a second skin forming around the old skin. When cooled cover with cling film or a cup saucer and leave in the fridge till cold or when you are ready to eat. This dessert is normally serve on its own. 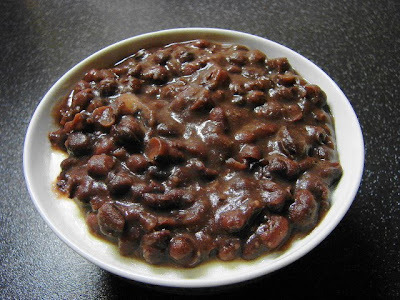 But if you fancy you can top it with fruits like soft mango, tin cocktail fruits, lychee etc., or with warmed boiled sweetened red beans (aduki beans) like this below, hot beans and cold custard mmm....luvly. If you find the flavour of the custard too bland you can add few drops of vanilla, rose water or a little ginger juice to the custard mixture. Normally this dessert is serve cold, but if you like it hot or warmed that is ok too. The fuss with this dessert is to successfully build up 2 layers of skins on the custard. If you are not bothered just mix everything together from cold, strained and steamed. Heh heh heheh! Can't believe you found the recipe and made this after I mentioned it after making the "Chinese Yogurt – Ginger curd 薑汁撞奶"
I look forward to making this soon! Yum Yum! Oh, yes, you mention 200ml-215ml full cream milk per portion, and each portion requires one egg white in order to set it? So, If I were to make 4 rice bowls, that would be 800-860ml milk and 4 egg whites and perhaps 4-12tsp of sugar? Yep multiply as required. I would use more milk than less in case of any spillage. Did you see my comment re the amount of ginger juice for the ginger milk curd. Do you have a recipe for : 楊子柑露 Yeung Ji Gum Lo? Sorry if the chinese is wrong - it's hard finding the chinese words. It's a dessert with mango juice & pieces, sago pearls and pomelo shards - often served cold and sometimes found in dimsum restaurants. My mum loves it and seems to think she needs to find mango ice-cream in order to make it. I know what you meant. I think the correct Chinese writing is 楊枝甘露. I will post a recipe on a new post. Ah yes! That's the one! 楊枝甘露. I don't have chinese characters on pc and use google translate to find an english word to translate to chinese - yes! Very time-consuming! 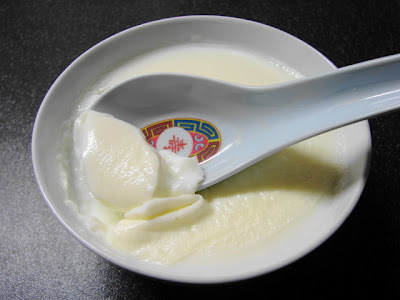 Thank-you about comment on Ginger Milk Curd, try using 1 1/2 tbs not chinese soup spoons! Haven't found new guinea-pigs to try that one on again - maybe my cousins will be the lucky ones! Heh Heheh! Look forward to the new recipe of Mango and Pomelo in Sago-Pearl Dew - no idea what it should be called! PS: Do you think if I dilute the milk (1 cup milk 1 cup water) and use 1 egg white, it will have the chawamushi texture? Did you follow my recipe? The first layer is created by cooling the boiled milk in individual bowls without disturbance or covered by anything. Quicker or better if you leave the bowls of milk to cool near a fan or airy place or warm place like a warm oven. The texture is firmer than ginger milk curd, like any other egg custard. Better to use full cream milk than low fat milk for a thick layer of skin. If you dilute the milk with water the skin will be very thin. Milk skin is formed by drying of milk or milk protein. Just finished making this recipe again =) This time I use the microwave to boil the milk and wow! an instant skin. So happy, now the milk has 2 layers of skin, but, the texture is still similar to ginger curd T_T Do you think the reason lies with the egg cos yr recipe calls for a large egg. What I have is just a med small size egg. If the texture is too soft you need more egg white. Try 150ml milk per egg white using this small egg size you have. Okie, this time will try using 2 egg whites (think I'll leaving out the skin portion and steam the milk with egg straight). Keeping my fingers cross =) Will post the result after completing. =D caught the culprit! It's the egg. With double no. of eggs the curd is firmer. Thanks for the advise. I got this recipe from a friend and have had a hard time in consistently getting the second skin to form. Your slideshow came in very handy! I also write a food and travel blog and when I finally get the recipe perfected, I will link the post to your well articulated recipe.